My Welldoing coaching, inspired by the work of David Allen and his seminal book 'Getting Things Done: How to Achieve Stress-free Productivity, can help you get the balance right. There are 2 key dimensions to the approach - 1, Getting control of your workflow of stuff. 2, Gaining perspective into aligning this stuff to you higher purpose. The online questionnaire (don't panic it's a quickie - 2 mins?) at the bottom of this post plots where you are now against these Control and Perspective criteria. 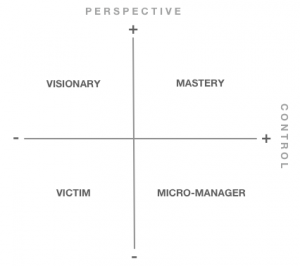 If you have a lot of control with low perspective you are probably a micro manager - very organised but lacking vision and inspiration. If you have low control and low perspective you are probably a victim - very responsive to stuff but stressed and lacking direction. If you have high control and high perspective you are a probably a master and commander - steering your life where you want with clarity and impact. In reality we can move around these roles and are not fixed. Welldoing gives you the tools and skills to navigate this with greater understanding, practical thinking and simple tools. If you want to see how I can help you, have a look here or email me. Why wait anymore for the life you want?